The one we'd been waiting for. 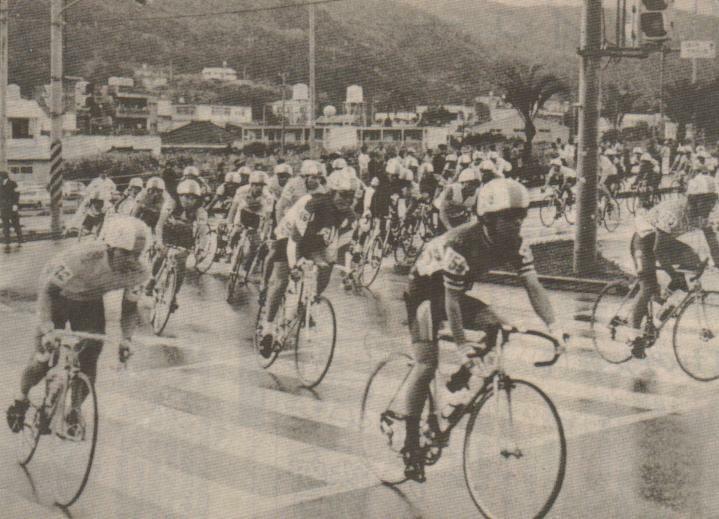 The Tour de Okinawa was the longest bicycle race in Japan, with riders from all over the world, including America's Steve Larsen and Nate Reiss. Miimii and I departed Narita Airport the morning of November 25, the day before the race, with my bicycle in the same bag I'd used for Zama back in July, stuffed into the overhead compartment of our plane. Then I needed to be sure I put it back together perfectly. (Left-Right)Keith, in the red jump suit, J.T. in white T-shirt, Doug, me to his left, and I don't know the rest. Miimii took this at the registration the day before the race. Doug, J.T. 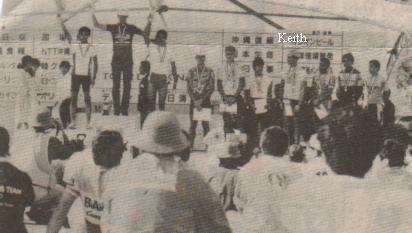 and Marion Yester, a cycling friend from Yokota raced the 100 while Keith and I raced the 200 kilometer race. (Left and Below)I'm #143, with Power Bars stuck to my top-tube, surrounded by 182 riders preparing to start in a slight drizzle. (Right)The front page of the Naha newspaper in Okinawa from November 27, 1989. 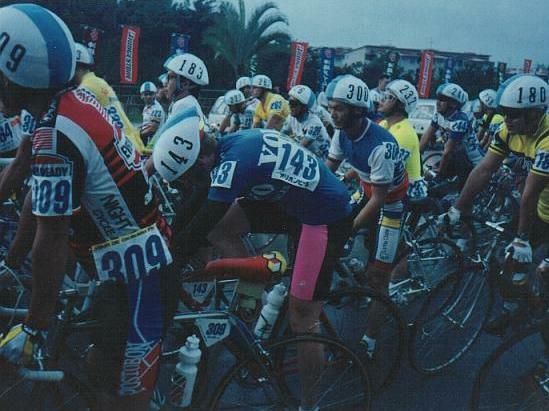 The two vertical pink stripes are my shorts, and I'm wearing a dark blue jersey with long black sleeves. 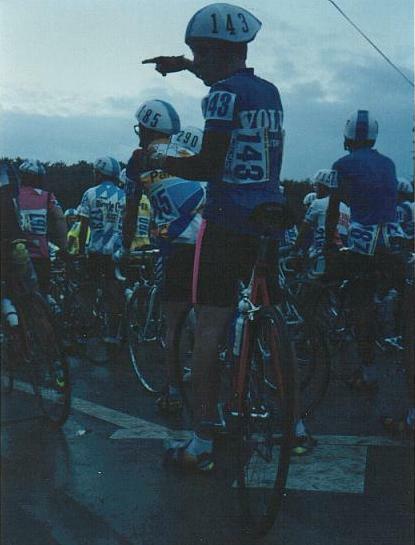 On the bottom left of this photo, in the bright yellow jersey, riding the orange bicycle is Steve L. Pack (more on him later). 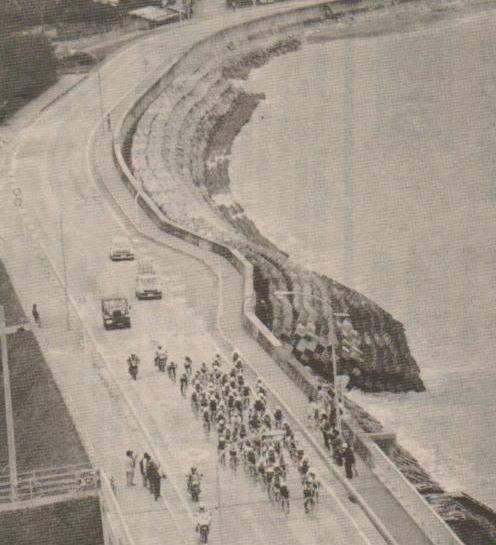 (Left)The riders flew out of town at an unbelievable pace (I expected a slow start on a 200 kilometer race). There was a method to their madness...the top 20 amateur riders caught the pros and worked with them to build a huge lead on the rest of the amateur field (photos clearly show this). Apparently the Japanese rules didn't prohibit this. The riders in front of me were nervous, skidding all over the road as if they'd never ridden in the rain before, and I crashed a few miles into the race when a chain reaction of sliding bicycles ran me off the road (again). I got up, wiped the blood off, and went in chase again. 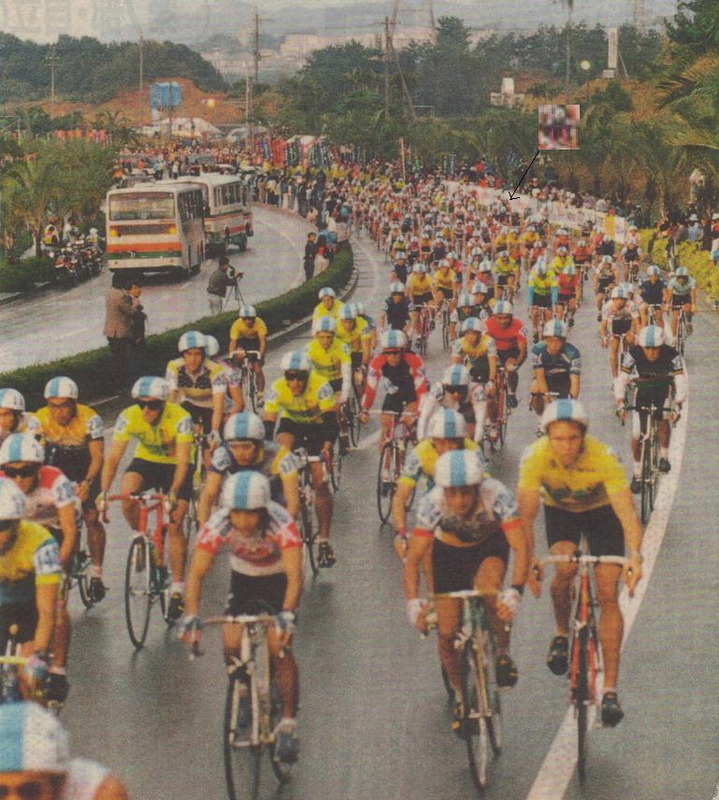 (Below)I'm the 6th rider from the right, 50 kilometers into the race. This race was really big...people were standing along the roadside for most of the race cheering us on (right), and helicopters buzzed overhead filming the action. Pictures were all over the papers. At this point I knew I was in trouble. Keith had made the big break at the start and was up with the pros (picture to the right), and the rest of us had to work together to catch the leaders. One small problem...the Japanese acted as if they'd never seen a paceline (this was common with the Japanese...they didn't like working with other riders). Steve Pack was our Okinawa contact for us who lived in mainland Japan and was on Keith's team. I raced for Volvo. I told Steve,"We need to work together, now...or it's all over" to which he replied,"Oh I don't care...my teammate is with the lead group". I shook my head...unbelievable. On July 20, 1995, on a club ride in Virginia, myself and the other riders were discussing Fabio Casertelli, the Italian rider who'd been killed in the Tour de France. One rider said he'd known a guy in Okinawa who bragged about not wearing a helmet and was killed when he ran into a truck. I said,"Oh? 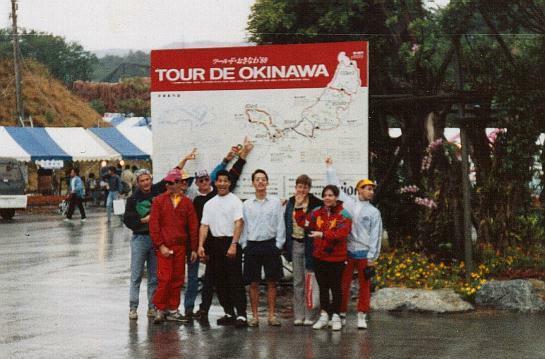 I raced there in 1989 when I was stationed at Yokota...ever hear of the Tour de Okinawa?" He said,"I raced it that year...you must have been with Keith Orme". It turned out he was Steve Pack...I never met him before but we ran into each other in Virginia!!! I told him about the rider who didn't care about catching the leaders and Steve said,"That was ME". I never knew. He described the bicycle he was riding and I found him in the same picture with me. He told me Keith had been sent to prison for something I'd rather not mention here. Back to the race...I attacked on the first climb and easily left my group. Steve said,"Take it easy...it's a long race". 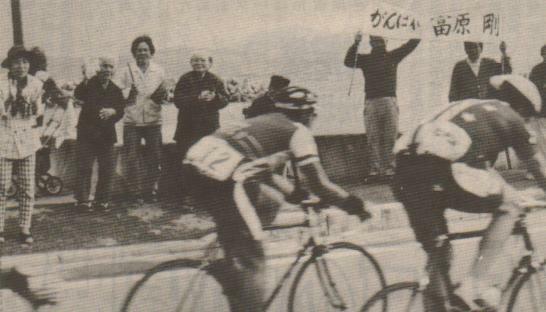 I chased alone for 100 kilometer through the mountains of Okinawa, never once passed by another rider. We had misinterpreted the rules and thought we couldn't use our bike computers, so I never knew where I was or how fast I was going...and the officials were Japanese. No one could tell me my position or deficit. 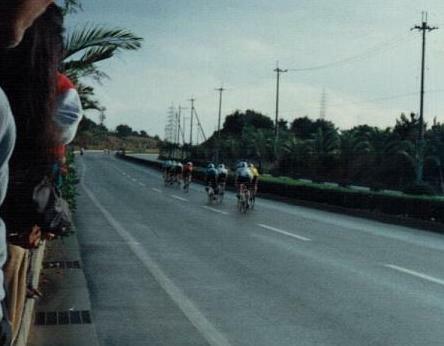 At 145 kilometers, I was pulled from the race for being too far behind. It was the first time I'd known how I was doing. In the 100 kilometer race, J.T. finished in the pack, and Doug got third. race. I was good but not good enough. Keith got the last laugh and finished 7th against the top amateurs in Japan...outstanding!